The governorship election petition tribunal sitting in Owerri, today dismissed the petition brought before it by Imo state governorship candidate for PDP , Chief Emeka Ihedioha in the April 11 election governorship Election.After duly considering the arguments by both counsels, the chairman of the tribunal David Wyon, ruled that the petition was not filed within the stipulated time frame. Counsel to Governor Okorocha had argued that the petitioner failed to pay the necessary fees on the day he approached the tribunal which amounted to making the petition time barred. He said the panel had no right to hear the petition since the filing was not within the legally stipulated time frame. Mike Ahamba, counsel to Ihedioha, countered Rochas counsel argument, saying the fees were paid as at when due. Ahamba went on to urge the panel to disregard the motion challenging the petition. He added that the Rochas counsel was only trying to buy time. 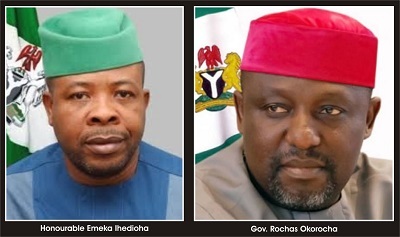 The court however deferred to Governor Rocha's Okorocha's counsel.